A great way to commemorate the one-year anniversary of the infamous Equifax breach (September 7, 2017) is to take steps to protect yourself to keep your information secure. First, the backstory: Equifax, a financial information company based in Atlanta, reported a cybersecurity incident that potentially affected 143 million U.S. consumers. Between May and June 2017 , criminals gained access to certain Equifax files through application vulnerability on a U.S. website. The information exposed included social security numbers, birth dates, addresses, and drivers’ licenses. Approximately 209,000 credit card accounts for approximately 182,000 U.S. consumers were also compromised. These accounts include dispute documents and personal identifying information. Even a year later, the cleanup continues . For a lot of us, the breach was a wake-up call. 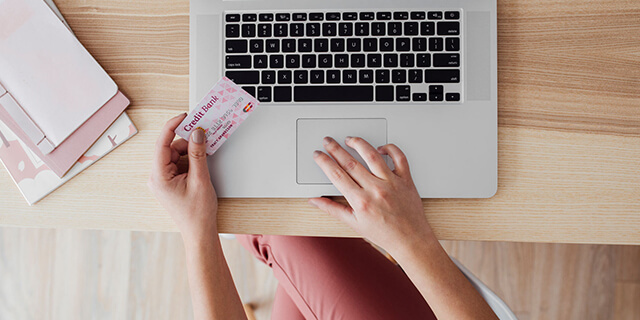 If you’re concerned about your data’s safety, there are many tips to protect your credit and your data, as well as ways to allude credit card fraudsters and help keep your information safe. Let this Equifax breach be the red flag that helps you avoid credit card fraud and protect your credit. How does fraud happen anyway? Unfortunately, the ways are countless. It could be a scammer going through your paper recyclables on trash day (are you shredding your financial info before tossing?). It could be a waiter or waitress with designs on the credit card you hand them while finishing your coffee (all that takes is a smart phone camera). Maybe you want to win a trip online, but first you need to type in your credit card number and other personal info. Then there’s the stuff that’s out of your hands: the website of your bank or favorite retail store gets hacked. Before you learn the steps of defense, it helps to get real. Know that credit theft and data breach can happen to anyone at any time. As much as this is unfortunate, the more you know, the more you can duck, sidestep, and bounce back as the punches are thrown. With a paper and pen, write down all of your account numbers, expiration dates and phone numbers to report fraud. Put them in a safe place, like a locked file-cabinet drawer. And never write account numbers on the outside of an envelope. Shred old receipts and paper statements after you review and record them. Don’t leave them lying around where anyone can see them. And don’t just throw them away; first tear them to pieces. Use encryption software that will scramble any information you send over the Internet. How do you know it’s safe? A “lock” icon will appear on the status bar of your browser. If the icon isn’t there, don’t send it. Only the people you deem appropriate will be able to unscramble the info. Use strong passwords that nobody but you could figure out. Try an inside-joke sentence, or switch numbers and letters. Make it so cracking the code is impossible. Nobody on the phone should ever get your credit card number unless it’s a company and a phone number you know. If you’re unfamiliar with them, don’t share. Keep your credit cards separate from your wallet or purse. If those get stolen, your card should still be with you. Also, try to only take the plastic you’ll need for where you are going. No reason to keep every credit card you own on your person. We all like to share online, but fraudsters are gonna fraud. They’re looking to learn more about you that will get them easier access to your accounts. Fight the urge: don’t post your birthday (plus the year you were born), address, or phone number online if possible. Don’t be shy about calling your credit card customer service department often. Let them know when you are traveling to a new location, so it doesn’t look like fraud is being committed. Of course, report any shady charges or transactions right away. Remember that once you report a loss or theft , you have no additional responsibility for charges you didn’t make. For each card lost or stolen, your liability is $50. You may have to sign a statement under oath stating that you didn’t make the purchases. Need more financial advice while protecting your credit and your data? When you invest with SoFi, our SSL encryption, two-factor authentication, and Face/Touch ID work together to protect your data and your credit. SoFi members get professional advice on goal planning, diversification, portfolio selection, and auto-rebalancing. Plus, members can start investing with as little as $100. Check this out, too: our SoFi Money mobile-first cash management experience (coming soon) fights against fraud by using a two-factor authentication to protect access to your account through the SoFi website or mobile app. Two-factor authentication means we use a device-based security layer in addition to simple password validation. On our website, you have the option to receive a security code by SMS or to use Google Authenticator. Mobile app users can also use fingerprint recognition. SoFi Money acts like a checking account, but pays a higher interest rate on your deposits, just the way a savings account would. Pay no account fees, and unlimited reimbursed ATM fees, as well as P2P payments, bill pay, and more. Sign up for SoFi Money today! SoFi can’t guarantee future financial performance. This information isn’t financial advice. Investment decisions should be based on specific financial needs, goals and risk appetite. The balance in the SoFi Money account is swept to an FDIC-insured account at one or more Program Banks where it earns a variable rate of interest. The Annual Percentage Yield (APY) for SoFi Money accounts, effective as of 8/1/18, is 1% for all balances in all states. Interest rates are variable and subject to change based on FFIEC. All SoFi ATM withdrawal fees will be waived for your SoFi Money Account. In addition, your account will automatically be reimbursed up to 6 withdrawals per month for ATM fees charged by other institutions while using a SoFi Money Visa® Debit Card linked to your account at any ATM displaying the Visa, PLUS, or NYCE logo. The reimbursement will be credited to the account by the following business day. Please note, there is a foreign exchange fee of 1% that is not waived, which will be included in the amount charged to your account. Advisory services offered through SoFi Wealth, LLC, a registered investment advisor. Neither SoFi nor its affiliates is a bank. SoFi MoneyTM is offered through SoFi Securities, LLC, member FINRA /SIPC . ABOUT SoFi SoFi helps people achieve financial independence to realize their ambitions. Our products for borrowing, saving, spending, investing, and protecting give our more than half a million members fast access to tools to get their money right. SoFi membership comes with the key essentials for getting ahead, including career advisors and connection to a thriving community of like-minded, ambitious people. For more information, visit SoFi.com. Want an easy and convenient way to manage your financial life? Get the SoFi app. For iOS and Android.